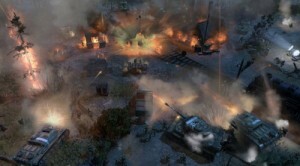 SEGA have dropped a lawsuit on THQ over money they were owed from Steam pre-orders of Company of Heroes 2. There were 20,755 pre-orders for Company of Heroes 2 registered through Steam from September 2012 to 24th January 2013. This generated revenue of $1,345,301.29 with Valve taking a 30% cut of those sales. This left THQ and Relic Entertainment with 70% which amounts to around $941,000. SEGA claims it’s owned $508,877.85 from those pre-orders as Valve paid THQ after 19th December 2012, the day it filed for bankruptcy protection. SEGA have officially announced the acquisition of Relic Entertainment. The company was previously owned by THQ and were responsible for the Warhammer 40K games Dawn of War and Space Marine. You can read the full announcement at the SEGA Blog by clicking here. SEGA has successfully won Relic Entertainment (developers of Warhammer 40K: Dawn of War and Space Marine) meaning it now has control of both the Warhammer license and Warhammer 40K license. SEGA paid a whopping $26.6 million. In other news, Platinum Games has shown an interest in buying the Vigil studio who own the rights to the Darksiders franchise. This is an interesting move in that Platinum Games’ Bayonetta was released the same week as the original Darksiders. The Vigil studio was not put up for auction with the other THQ franchises which could mean that Platinum Games make a deal with THQ out of auction for the lower price that Inaba-san is talking about.